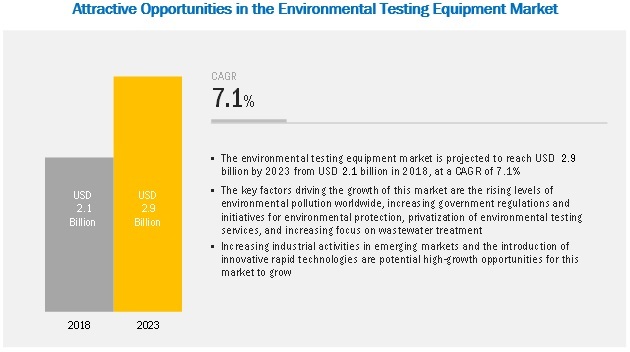 [161 Pages Report] The environmental testing equipment market is expected to grow from USD 2.1 billion in 2018 to USD 2.9 billion by 2023, at a CAGR of 7.1% during the forecast period. Growth in the market is primarily driven by factors such as rising levels of environmental pollution worldwide, increasing government regulations and initiatives for environmental protection, privatization of environmental testing services, and increasing focus on wastewater treatment. On the basis of products, the global market is segmented into mass spectrometers, chromatography products, molecular spectroscopy products, TOC analyzers, pH meters, dissolved oxygen analyzers, conductivity sensors, turbidity meters, and other products. The mass spectrometry segment is expected to dominate the market during the forecast period. Mass spectrometry is a highly specific method for the study of small and volatile molecules, which is a major driving the growth of this segment market. The various technological enhancements in GC-MS systems are also supporting the adoption of MS in environmental testing. Environmental testing equipment is widely used to test the quality of drinking water, screen pesticides, and assess soil samples for contamination. The environmental testing equipment applications market is segmented into water testing, air testing, and soil testing. The water testing segment held the largest share of the market in 2018, a trend that is expected to continue during the forecast period. The large share of this segment can be attributed to the increase in industrial activities worldwide, which, in turn, has led to a rise in the disposal of industrial wastewater and effluents into water bodies. Factors such as the to the growing funding for environmental testing and cleanup, along with favorable regulations, growing awareness, and the availability of funding for environmental conservation are driving the growth of the market in North America. 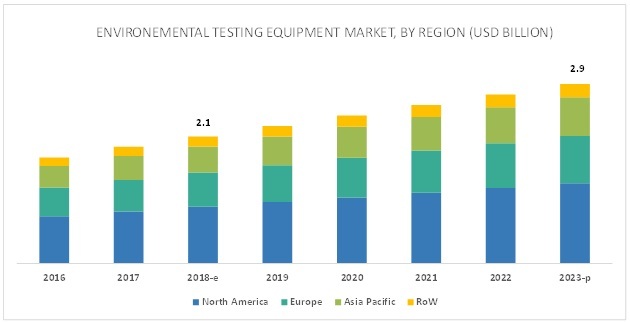 The major vendors in the global environmental testing equipment market are Agilent Technologies (US), Thermo Fisher Scientific (US), Waters Corporation (US), Shimadzu Corporation (Japan), Bruker (US), PerkinElmer (US), SCIEX (a subsidiary of Danaher) (US), JEOL (Japan), Analytik Jena (Germany), and Merck KGaA (Germany). In March 2018, Agilent established a new logistics hub in Shanghai to enable rapid delivery of the company’s instrument parts, supplies, and consumables to laboratories in China. In August 2016, Shimadzu acquired SINC (SINC do Brasil Instrumentaçâo Cientifica Ltda.) to strengthen its analytical and measuring instruments business in Brazil. Which of the product segment will dominate the global market in the next five years? Emerging countries have immense opportunities for the growth and adoption of environmental testing equipment, will this scenario continue in the next five years? Increasing environmental awareness in the emerging market is impacting the growth for developed markets. How will the pricing difference impact the overall market? What are the upcoming technologies in the global market? The environmental testing equipment market comprises several stakeholders such as environmental testing equipment & consumable manufacturing companies, suppliers & distributors of environmental testing equipment, equipment raw material suppliers, research institutes and academic centers, environment protection agencies and institutes, agricultural analysis companies, market research companies. Various primary sources from both, the supply and demand sides of the market were interviewed to obtain qualitative and quantitative information. Following the breakdown of primary respondents. After arriving at the overall market size using the market size estimation processes as explained above the market was split into several segments and subsegments. In order to complete the overall market engineering process and arrive at the exact statistics of each market segment and subsegment, the data triangulation and market breakdown procedures were employed, wherever applicable. The data was triangulated by studying various factors and trends from both, the demand and supply sides, in the environmental testing equipment industry. To track and analyze competitive developments such as product launches, acquisitions & expansions, partnerships, agreements & collaborations, in the environmental testing equipment analysis market. This research report categorizes the environmental testing equipment market based on product, application, and region.